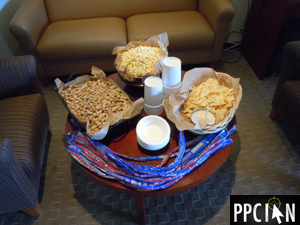 Last night, our Google AdWords team treated myself, my team, and leaders from my employer to the Giants/Dodgers game. 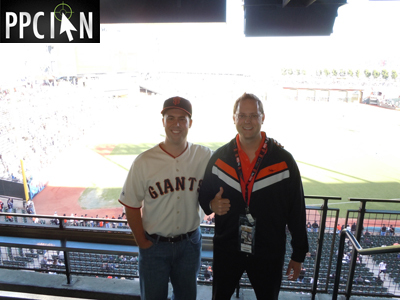 We had so much fun enjoying the game from Google’s luxury suite at AT&T park. It was honestly one of the best networking events I’ve experienced with Google. It was a great game too – The Giants won in an 8-0 victory. Thanks Google, we cannot thank you enough! A few weeks ago, our Yahoo! account management team traveled to Silicon Valley and took us to a gourmet lunch (one of the best meals I have experienced in months). That day, we also spent hours planning strategies to grow our adCenter campaigns. Yahoo!, we cannot thank you enough, you rule! I am so thankful for the amazing friendships that I have made with Google, Yahoo!, and Microsoft’s world class teams. This is a quick post today since I was out late at the game last night. The main point: I have found in business that it’s all about building world class teams. 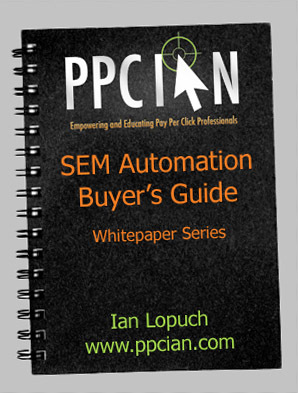 Spend time to really get to know your search engine reps and support teams. They are amazing and I couldn’t imagine running enterprise SEM accounts without their support and guidance. 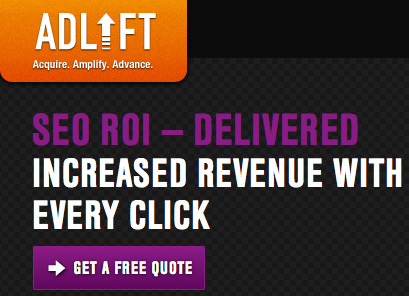 As a team, you will uncover amazing opportunities and take your paid search engine accounts to new levels. If you’re not on Google+, make that investment now. Make sure to get in as many people’s circles as possible. Make your Google+ profile great, and get lots of interaction happening. This is going to be another major source of traffic to your site. 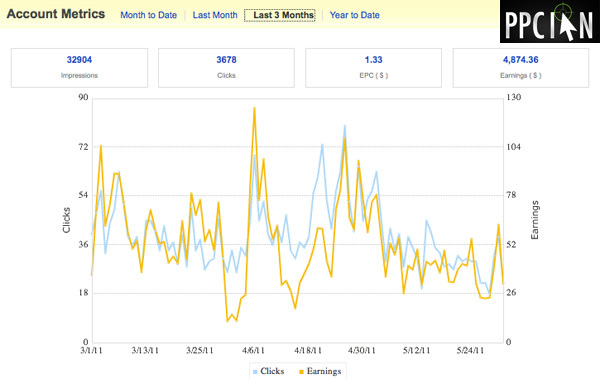 If you’re a big paid search advertiser, make sure to get in the top, yellow bar if at all possible. The paid results on the right rail are getting pushed down. If you can make it into the yellow bar, you’re set. Otherwise, your traffic is going to drop on such terms as “insurance”. The corporate online marketing career path is amazing. 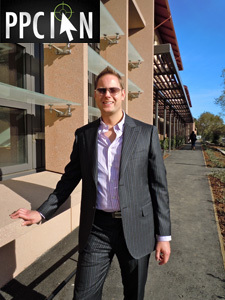 It’s a career full of big responsibility, fast-paced growth, complex problem solving, and high powered networking. 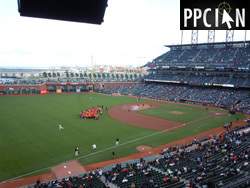 On the networking side, there’s been a really cool trend over the past year or so – It’s all about networking at AT&T Park in San Francisco, home of the Giants. 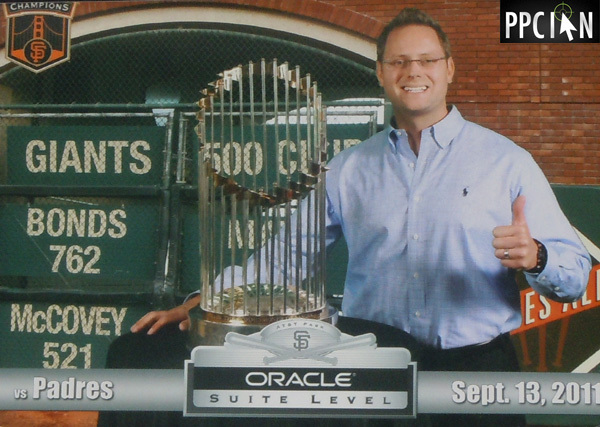 Earlier this year, I enjoyed the Giants/Dodgers game from Marin Software’s luxury suite (check out A Day In the Life of PPC Ian). Also earlier this year, I enjoyed the Giants/Marlins game from Google’s luxury suite (check out Amazing Times With My Friends at Google). Tonight, I had an amazing time yet again at Google’s luxury suite for the Giants/Padres game. Google is really going all out when it comes to building relationships with their big advertisers, I cannot thank them enough. I had so much fun tonight and especially enjoyed the opportunity to get a picture with the Giants World Series Trophy (below), a special gift to the first 500 luxury suite attendees. If you’re thinking of getting into online marketing (or are already in this amazing career), remember to focus on networking. The relationships will take you so far! I’ve been networking with Google like crazy lately, it has been a real blast! 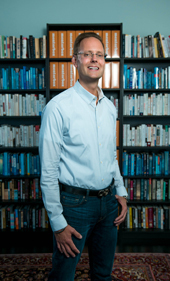 Today, I wanted to share some cool pictures with you, in addition to my insights about Google as an organization. In short, Google is on an amazing roll, they are reaching out to clients like never before and it really means a lot to corporate marketing professionals like myself. As you can see throughout this post, I enjoyed two amazing Google events within the last few weeks. 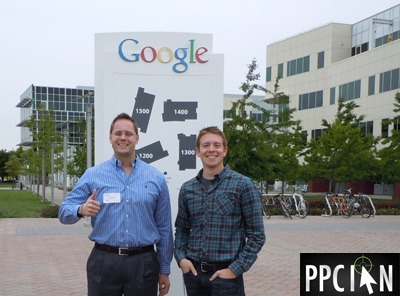 Highlighted in the first picture, I recently visited Google’s Mountain View campus to meet with Kit from the DoubleClick team. As a follow up to my recent speaking engagement at Google, Kit reached out and scheduled a meeting with me for my feedback and insights on some of their new tools. I really enjoyed viewing their new tools and contributing feedback. Our meeting lasted a good hour+ and was super productive. I must say, it was quite the honor! It’s not everyday that I get invited to Google for 1-on-1 time regarding their latest products. 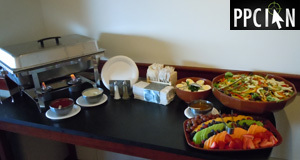 Kit was really gracious to treat me to an amazing Google lunch (I can’t get enough of their gourmet food). I even got a tour and was amazed to learn Google has a new bowling alley. It’s really slick, better than the real thing! Kit and Google/DoubleClick, thanks so much and please don’t hesitate to reach out if I can ever be of further assistance. 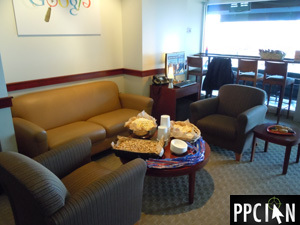 Also within the last few weeks, I attended the Giants/Marlins game in Google’s luxury suite. 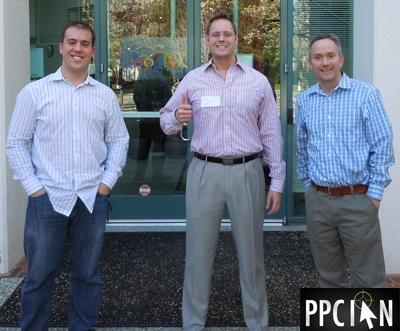 This event was hosted by none other than Dennis Woodside, Google’s President of the Americas. This exclusive C-level executive only event was a true blast and reminded me that I have truly made it big in online marketing. I was able to catch up with old friends from the executive teams of Nextag and Apollo Group (University of Phoenix’s in-house onith line marketing agency). I also enjoyed making new friends! Since the Giants game was an executive only event, I didn’t really have the opportunity to take too many pictures with attendees, but I certainly snapped some of the suite and food. I’ve been to four Giants games in the last year and three have been in luxury suites. 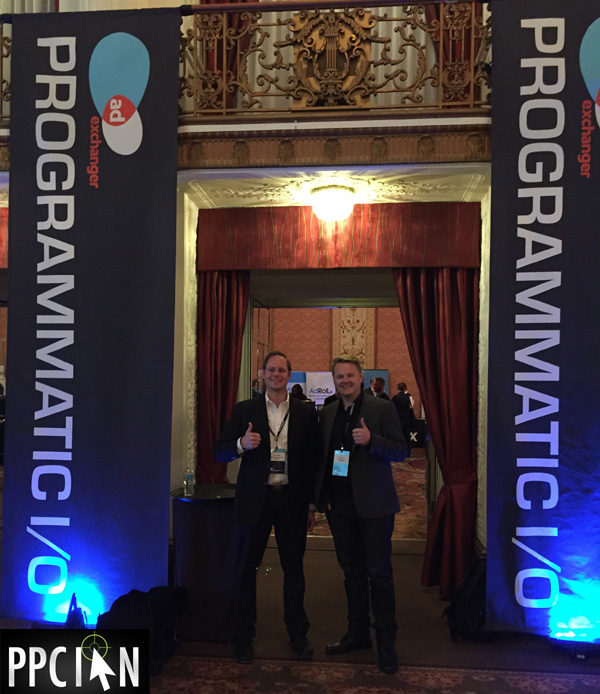 (You may wish to check out my recent post about A Day In The Life of PPC Ian where I highlight Marin Software’s luxury suite.) Now that I’ve been spoiled, I never want to go back to regular seats. This is just one more reason I love the corporate online marketing career path so much! Thanks again Google! So, what does this all mean? 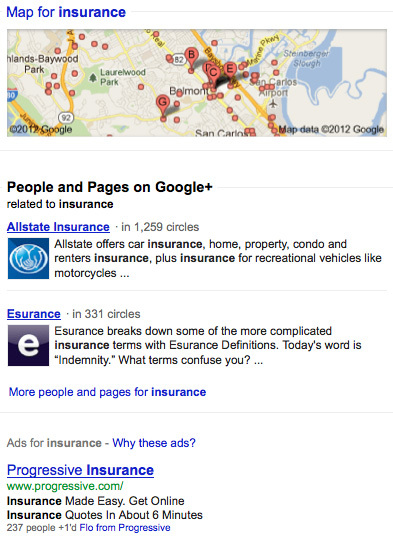 More so than ever before, Google is building deep relationships with their top advertisers. They have their sights set on the long term and are making impressive relationship investments that will last decades. I commend Google for their strong efforts in this arena because I’m also a long term type of guy. It is all about relationships, at the end of the day. Now, don’t get me wrong, Google has always been focused on client interaction, it’s just that they are now going 110 miles per hour versus 100. What does this mean for you, the corporate Internet marketer? Seize the opportunity! Now is your chance to reach out to Google. Now is your chance to get heard! Now is your chance to build relationships that will last forever. I want to close out today with an important tip that has served me really well: If you truly want something, you need to ask for it in a nice but strong way. How did I get invited to originally speak at Google? How did I get invited to an exclusive C-level executive Giants game with the top executives at Google and in the Bay Area? I asked! Opportunities are all around you. If you remember to ask, you shall receive (most of the time). Even when it comes to promotions/raises at work, it never hurts to ask, as long as you’re a top performer. Just remember to always give back and prove your value over and over. Thanks for reading everyone and now go reach out to your Google account management team and start networking! It seems like Google is always testing something new. Whether we’re talking about Google AdWords, organic search, or simply the overall look at feel of the Google experience, there’s always something new and exciting. Just recently I wrote about Google’s new mega titles and organic sitelinks. The mega titles test stuck (and are amazing), but the organic sitelinks test does not seem to have panned out (I don’t see these sitelinks anymore even though I really liked them). Today, I’m thrilled to share another new Google test. As you can see in the screen shot below, Google is testing a lighter shade of blue in the search results. I noticed the light blue a bit earlier today, but it’s already gone from my computer. It seems like a really low volume test right now. Personally, I think it’s a great idea to test the color of the link text. The link text color (on Google and other search engines) has been that classic darker blue color forever. It’s time to try a new shade of blue! I must say, however, the light blue hurts my eyes a bit compared to the classic blue so I must give my vote to the control in this test. To close out today’s short post, I want to encourage anyone advertising in pay per click to really stay on top of these tests. Seemingly small tests and changes on Google’s end can mean a big difference for your campaigns. If you’re like me and are in the corporate world of SEM, it’s even more important to stay on top of these tests. When you’re spending millions, these changes can have even more impact. Moreover, you want to know every new thing in SEM because you never know when your boss or another executive may ask you about the new trends they are seeing. Is Google Becoming Feature Rich? It seems like I’m finding a new feature on Google every other week! About a month ago, Google launched Google Instant, the algorithm that predicts your search query as you’re typing it in and serves up results in real time. Just in the last week, I noticed two other new features that are quite interesting. Today, I’d like to talk about my thoughts on Google Instant and also these two new features. It’s really crazy. I’d venture to say that the once minimalist Google experience is starting to become feature rich! From a user’s perspective, I have mixed feelings on the topic of Google instant. I’m a quick typist so it doesn’t save me too much time. Moreover, I’m really missing the search box at the bottom of the search results page. I like scrolling through all the search results and entering my next search query at the bottom of the page, but I now need to scroll back to the top before entering my next query. From a search marketing perspective, it’s possible that Google Instant will shift more traffic to head terms while taking away from tail terms. This is something I am monitoring closely and only time will tell if this hypothesis materializes. So, now the fun part – Following are some new features you may have not heard about yet. Check out the screenshot below. You see that little arrow on the left of the search results? This arrow started appearing for me last week. When I move the down arrow on my keyboard, it goes down to the next result on the page. It starts in the premium sponsored results, then goes to organic, then goes to the right rail of paid ads if you keep going down. When you hit enter, it actually clicks the result and goes to that website! Here’s why I think the new feature is annoying: I’m a big fan of scrolling up and down with my arrow keys. Now, when I scroll down, everything is slower because the rate at which the Google arrow goes down is slower than the normal scrolling of the page. Also, if you scroll back up after going down, the arrow disappears at the top of the page, the cursor goes in the search box, and now you’re prevented from scrolling up and down at all! In short, I find this new feature annoying. I’m going to close out with a feature that I really like. In the screenshot below, you will notice that I search for site:www.ppcian.com. Basically, I’m trying to see how many pages of my site have been indexed by Google. Check out the Google promotion ad at the top. It references the exact search query I’m buying! Now, you may argue, "It’s not referencing your search query, Ian. Google is buying your URL and using keyword insertion." I’ll argue back, that’s simply not true. How do I know this? 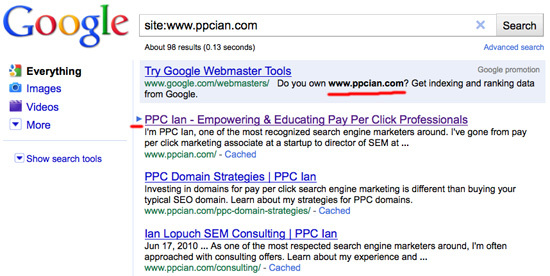 If I type in site:www.ppcian.com/* the trailing slash and star are also included in Google’s promotional ad. If I do it without the star, but with the slash, my exact query gets inserted again. I’m really excited about this technology. It would really open up a world of opportunity if I could leverage dynamic insertion of the user’s raw query in my search ads. You may be thinking, what does the second query above mean (the one with the trailing slash and star)? Whereas the first one shows how many pages are in Google’s index, the second one shows how many pages are in the "real" index (and not the supplemental one). Definitely useful stuff in the world of SEO. What do you think about Google’s new feature rich approach?